Mountainman Outdoor Supply company is New York's largest canoe, kayak and SUP dealer. 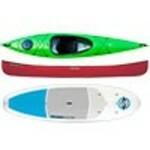 We stock over 1,000 boats and boards from more than 20 leading brands. If you have any questions, please call us at (315) 369-6673 (9am - 6pm, EST), and our staff will be happy to help you out.